A little closer to home, this review on a UK family run motorway service station, may seem mundane, but pulling over on a road trip up North last weekend, I was so wowed, particularly the thought put in for families, I thought it was worth sharing. Long family road trips on UK motorways can be an utter nightmare. You can arm yourself with travel games, upload new films for the ipod and take the biggest stack of healthy snacks but still feel daunted by the incessant tirade in the back by bored children/feuding siblings/hungry kids. You need to get from A to B with as few delays as possible, the road is long & boring and generally in the UK, jam packed with traffic. You really don’t want to stop unless it’s absolutely necessary, and when you do it’s in and out in double time. 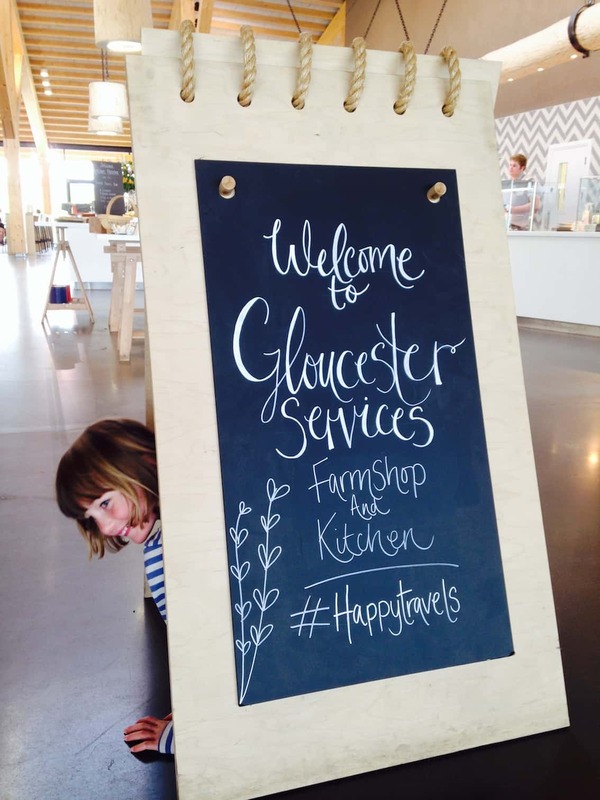 Gloucester Farm Services are not going to solve any of the fore-mentioned BUT it can genuinely put you all in a better mood on your onward journey. It’s seriously next level in service stations and is simply a joy to visit. Here’s why. Walking into the Scandinavian style glass & wood dome, you’re greeted by wooden tressles piled high with freshly baked loaves, fat slices of home made cakes (not pre-cut & packaged in plastic) & fresh scones with oversized jam jars of clotted cream & jam. The space is light and airy. The far side is wall-to-wall glass overlooking a petite lake. Your kids can run round the lake to let off steam and feed the ducks. Cheerful staff serve homemade meals from quality local ingredients, freshly made, not limp under heat lamps for hours. There are plenty of healthy options – vats of yummy soup with crusty rolls, salads & even sushi! They do kids portions of hot meals – our girls chose omelettes – freshly made to order. The PLAY area is a dedicated room for families with a wooden fort built into half the room. Complete with a small kitchen with sink and microwave, it enables families to heat up baby milk/food. Ella’s organic baby food sachets are on sale as well as healthy snacks for kids. The FARM SHOP is stuffed with high quality local produce, boasting a butchers counter, fresh vegetables from the farm, a burgeoning cheese counter, wet fish counter & a patisserie (with handmade chocolate truffles, merguines & macaroons!). Its staggering array of local produce is impressive, from nearby vineyards and breweries to jams & chutneys. Tip: mouthwatering pies, both savoury & sweet, can be bought here & heated in the PLAY kitchen. Well stocked, the children’s section has a fabulous range of quality traditional toys, organic kids clothing ranges such as Frugi and an interesting selection of travel games. Large FAMILY TOILET ROOMS mean you can all go together instead of allocating whose with whose – so much easier with small children and babies. They even have small toilet bowls for tiny bots. If you’re on a mammoth journey, roomy shower rooms give you a chance to wash off grime and refresh. The main toilets wouldn’t look out of place in a swanky hotel – sleek and modern with dyson dryers and freshly cut flowers in vases. I am an immediate convert. This Harrods of service stations, is a much more appealing stop that the tired grey services dotted the length & breadth of our motorway network. While I don’t think I’ll be heading there soon to buy a haunch of beef or some organic clothing, it’s a fab place to purchase a gift for an impending relative visit, pick up a souvenir from the area or simply browse through the remarkable array of posh products while stretching your legs. Even if you’re only popping in for a pee, and a latte, I guarantee you’ll be wowed. Our family love these services always making a stop on the way to visit our daughter at college! Excellent service lovely food and loads of choice! The coffee is very good and we love browsing in the farm shop! I love these services, we always schedule a tea and food stop here on the drive from Cornwall to Leamington Spa, lovely dog walking area too.